To anyone who has listened to our Jab Tak Hai Jaan Review (If you haven’t you should by clicking here) you can safely say that we are quite enamored by Anushka Sharma, I mean she could be reading the ingredients off a can of kidney beans in Binary code and we would listen with bated breath. With the first song promo released of her forthcoming Vishal Bhardwaj directed Matru Ki Bijlee Ka Mandola, we see her singing and dancing and pretty much stealing the show from Imran Khan. Now dancing may not be the man’s forte but the ability to grow quite impressive facial hair does seem to run in the family. We’re quite looking forward to this movie although Vishal Bhardwaj rustic taste might not be for everyone’s taste buds. Here is the poster, the first song promo and a synopsis of the movie. 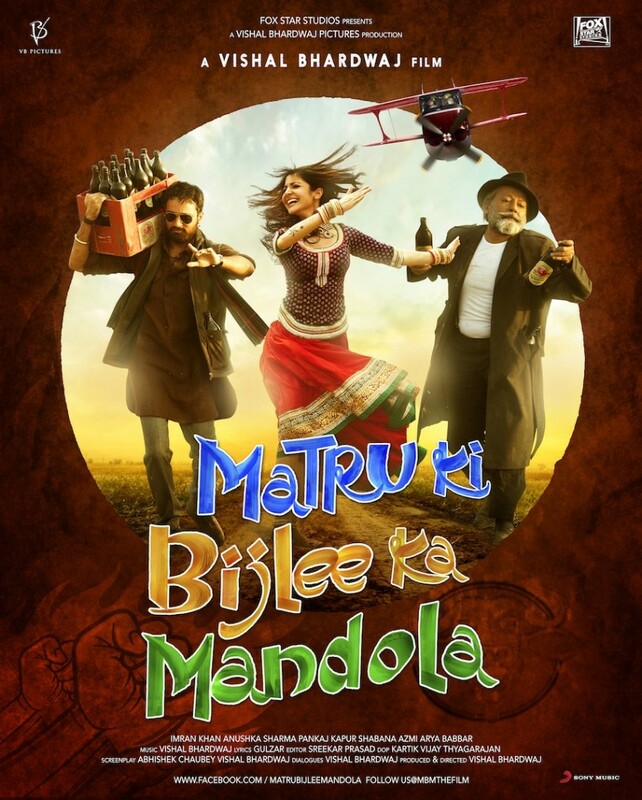 Set in the rustic surroundings of a village in Haryana in India, Matru ki Bijlee ka Mandola is a comedy-drama about Harry Mandola (PANKAJ KAPUR), a wealthy industrialist who loves his drink, his daughter Bijlee (ANUSHKA SHARMA) and the unusual bond they both share with Harry’s man-Friday, Matru (IMRAN KHAN). Much to her father’s delight, Bijlee is all set to marry Baadal (ARYA BABBAR), the son of a powerful politician Chaudhari Devi (SHABANA AZMI). This alliance which is far from just being a simple union of two young people becomes the seed for a story that brings twists and turns in the lives of Matru, Bijlee and Mandola. Matru ki Bijlee ka Mandola releases on 11th January 2013 by Twentieth Century Fox.